IWhether you love it or not, Valentine’s Day – that one day a year that can make grown men crumble under pressure – is right around the corner. I am fortunate. My husband, Rodney, puts a lot of thought into holidays, anniversaries and special occasions. He is a romantic at heart and seems to enjoy spoiling me with surprises. Over the years, however, I have come to realize that Valentine’s Day is painful for many men to navigate. In observance of this annual, over-commercialized celebration of love and romance, I thought I would share a few life lessons. If your significant other could use some help, communicate with him (or her) in plain language or feel free to leave these hints where they will see them. Why not make it a little easier for your Valentine to succeed this year? • When in doubt, stick to red roses for Valentine’s Day. Gerbera daisies just don’t send the same message. • If you have a budget that won’t accommodate a dozen red roses, consider a mixed bouquet that includes a few red roses or ask the florist to arrange a single red rose in an attractive vase with greenery and a ribbon. • Do not order flowers from a pop-up shop that sets up in a nearby parking lot just in time for Valentine’s Day. Regardless of how much money you think you will save, stick to local florists who have been in business long enough to survive many Valentine’s Days. It takes a well-oiled machine for a flower shop to survive Feb. 14 each year. It’s not a good time to take a risk on a newcomer. • Order at least a week in advance if possible, and get some sort of confirmation of your order. • Consider asking that the flowers be delivered BEFORE Valentine’s Day. A few years ago, I realized that Rodney wasn’t certain if it was acceptable to have flowers delivered early. I actually prefer it because I get to enjoy them leading up to Valentine’s Day. If you’re the sender, there’s also a less likely chance that your order will get lost or damaged in the shuffle if they go out a day or two ahead of the chaos. • There’s a reason that you see so many beautifully wrapped, heart-shaped boxes of chocolate on the shelves before Valentine’s Day. It’s romantic. Yes, you should consider the quality of the product, but it’s also about the pretty packaging. Most of the time fine chocolates do not come in ugly packaging. • There’s no need to buy the biggest box of candy or the most expensive, but heaven help you if you buy the smallest one with the Peanuts characters on it for your significant other. • Now would be a good time to know if your Valentine has a preference when it comes to chocolate. Knowing whether she likes dark chocolate or milk chocolate shows that you have paid attention. • A family-size package of M&Ms is awesome, but don’t pretend that it is romantic. • Chocolate-covered strawberries are also a romantic option to consider but must be ordered in advance from local bakeries or caterers. • If you can afford to buy fine jewelry for your Valentine each year, you should consider doing so. If you can’t, don’t let that deter you. Big box stores and local jewelers offer discounts on Valentine’s-themed jewelry each year. • Determine whether your significant other prefers gold, silver or perhaps rose gold jewelry before making a purchase. • Consider purchasing a vintage piece of jewelry from an antique store if you’re looking for something eccentric. 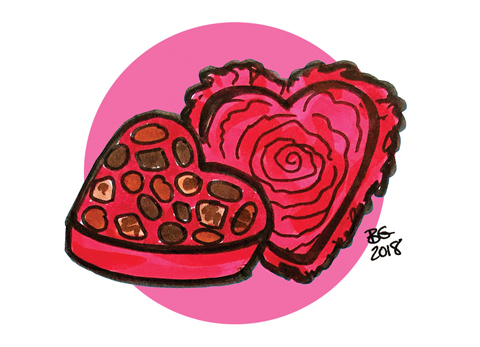 • Instead of diamonds or gemstones, shop locally-owned gift stores or galleries to see if they offer any Valentine’s Day jewelry made by local artisans. A few years ago, a local radio personality asked me if I preferred flowers, candy or jewelry on Valentine’s Day. My response to his question was simple: Yes. If you don’t wait until the last minute, you can succeed at Valentine’s Day without breaking the bank or crumbling under pressure. P.S. Don’t forget the card.